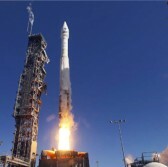 An Orbital Sciences-built spacecraft took off Sunday from Wallops Island, Virginia for the International Space Station, carrying nearly 3,300 pounds of technology and scientific cargo. Orbital and NASA launched a Cygnus cargo capsule aboard an Antares rocket at the agency’s Wallops Flight Facility at 12:52 p.m. Eastern time, NASA said Sunday. The Sunday launch marks Orbital’s second delivery mission under a $1.9 billion Commercial Resupply Services contract with NASA. The company is contracted to perform at least eight cargo missions to ISS through 2016. Payloads of the spacecraft include Earth observation nanosatellites, a technical and educational satellite investigation and an experimental three-dimensional mapping platform. Cygnus is scheduled to dock with the orbital laboratory on Wednesday morning.